Unless you’ve been out of it for quite some time, you’ve probably heard many nutritionists and fitness experts championing eating six meals a day. Don’t mistake this for a fad. While the amount of weight you lose or gain will be dependent on the total calories you take in, total calorie intake is not the only thing you should be concerned with. What you take in and how you take it in will prove to be major factors in what kind of weight you lose or gain (fat or lean muscle). Whether you are trying to lose weight, gain weight or just eat healthy, 6 small meals a day is much more advantageous than the traditional three big ones. For one thing, the body is only capable of utilizing so many nutrients at a time. With small meals, there is greater opportunity for nutrient absorption. With the goal of building muscle fast, you need maximum retention of the nutrients necessary to accomplish this goal. Providing the body with a complete protein source at EVERY meal will help your body maintain an anabolic, positive nitrogen balance state. Additionally, the body is more likely to store fat when it is unsure when it will get its next feeding. Your body is incredibly smart and whether or not you plan for the future, it does. When it becomes used to being fed consistently, to six meals a day, it tends not to worry so much about tomorrow’s need for energy and is therefore less likely to store energy as unsightly fat. Plan ahead. Make sure the nutrition necessary to follow your diet is within reach. Plan your meals at least a few days in advance. Cook ahead of time. Many foods that will help you reach your nutritional goals lend themselves to being cooked in large quantities then portioned out and refrigerated for quick and good eating. Chicken breast and boiled eggs are good examples. Get some Tupperware and you can eat well with minimal kitchen time. Take advantage of canned foods high in protein. You may know that tuna comes in a can making a quick and simple meal, but did you know that salmon, chicken breast and other protein-rich foods come in cans? Check your grocery store. And the number one helper to keeping to a six-meal-a-day plan (drum roll please)… SUPPLEMENTS. You can keep to your weight gain diet without using supplements but it will be exceedingly more difficult. There are meal replacement powders, whey protein powders, weight gainers and other supplements that have good nutritional content and will make your meal planning much simpler. For more information, head to the Bodybuilding Supplement Guide. While it may be impractical to sit down and eat six times a day, when you consider that some of your meals can be just a quick gulp of a protein shake the diet plan can become practical for even the busiest of people. With just a few smarts and a little creativity, you will find your meal planning isn’t as difficult as it may first appear. 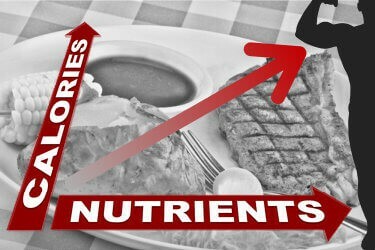 It is helpful to include a blend of “constant meals” and “change-ups” into your eating plan. The constants are quick meals that you may eat every day. Change-ups have a little variation to them and add variety to your diet. Once you have determined your weight gain diet guidelines, make sure you get your plan on paper. Figure out the specific foods you will use to get to your prescribed calorie and nutrient goals. Work out your eating schedule. Quick prepared meals (constants) may be necessary for meals where you don’t have a lot of time to eat (i.e. breaks at work), and you may get to shoot for a little more appetizing treats (change-ups) when time allows. If you absolutely find it impossible to fit six meals a day in, shoot for five. Even four would be better than three. The key is having everything ready to go and not giving yourself an easy excuse to grab the empty nutrition of a soda and chips snack. Don’t tempt yourself into to being lazy. Again, always track what you are doing with your diet. This, when compared to your results, will give you guidance on what you are doing right and what you are doing wrong. It is smart to eat frequently but whether you eat two meals, twenty-two meals or six meals a day, it isn’t going to be as going to play as big a role in the weight gain process as exactly How Much You Eat. Figure out how much you need to eat to on this page – Diet to Gain Weight: How Much and What to Eat.